The fuel spider/purge valve assembly arrived at Airflow Performance this morning, and by early afternoon I had a phone call with the results. They flow tested it and found it met the specifications. To be thorough, they disassembled it for inspection, checked over all the internal parts, finding nothing wrong, cleaned & reassembled it. A second flow test also showed everything to be within new limits, so it’s being sent back to me, hopefully to arrive before the weekend. Talking with the Airflow folks for a good half-hour (plus the 20 minutes last week), they feel that the colder EGT is of no consequence, and as long as the engine is running smoothly, can be safely disregarded. We seem to have tied it to fuel flow though, whether due to the spider port or the injector line. 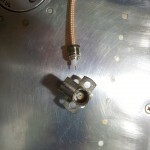 Setting aside that problem for a moment; it is their belief that the hot, low-RPM stumble is related to fuel vaporizing in the line between servo and spider, due to heat absorption and the fact that the fuel in that line at idle is very low volume (<1gph) and pressure (essentially 0 psi, since the flow is so low). 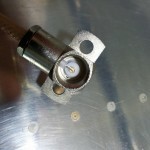 We verified that I have the correct (.022 for the IO-320) restrictors installed. He said that they get regular calls in the summer months with similar symptoms, and the call volume dries up in the colder months of the year. 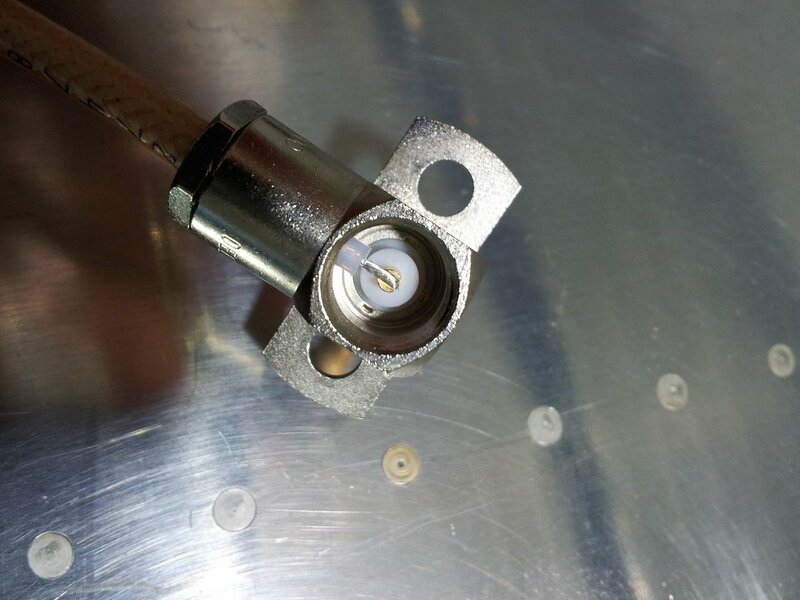 Some suggestions were offered for remounting the fuel flow transducer and shortening the servo->spider fuel line as much as possible to minimize heat absorption. Precisely which piece is the “heart” of the FI system, I don’t know…but it seems like a worthy description of the fuel distribution spider, which has 6 different fuel lines, plus a control cable, connected to it. A short flight test this morning — with the #2 and #4 nozzle lines reversed — indicated that the cold EGT followed the line/port, and did not stay with the cylinder. #4 was now the one dropping to ~500 degrees, while the others stayed higher. A couple phone calls later to Aero Sport Power and Airflow Performance resulted in AFP saying that it seems something isn’t right with the fuel spider. The theory is that the #2 port is flowing richer than the other three (and this agrees with both flow tests I’ve done, though the difference isn’t much at all), and this extra fuel at idle is causing the cylinder to run cooler. So as a first step, at their request, I’ve pulled the spider and purge valve assembly (it’s one interconnected piece) off the engine, boxed it up, and shipped it off to the Airflow shop. Sadly, it won’t arrive there until Wednesday morning, even with 2-day shipping. Depending on how long it takes to service and ship back, I’ll expect to see it back here shortly after Labor Day. While it’s at the shop, they will test and rebuild as necessary to match the flow. AFP also believes the stumble may be caused by vaporizing fuel…a theory I also entertained briefly (this by giving them only the symptoms, not suggesting any particular problem). So, we’ll attempt to solve the equal flow issue first, see if it helps the stumble, and then proceed to working on the stumble if not. Allison also brought Mom and Grandma out to the hangar for a brief visit this afternoon, and mom got to try the plane on for size. Someday when she’s back in state, we’ll get her up once the flight test is over. After reviewing the latest engine data logs, the recommendation from the engine & fuel system folks is that I swap the injection lines between #2 and #4, so that the output port on the fuel spider feeds a different cylinder. Then see if the EGT drop stays with the cylinder, or follows the port. So, went out to the airport tonight to make that swap. The nozzle lines are barely long enough to do it, but with careful bending and securing with Adel clamps, I moved the injector ends of lines 2 & 4 to the opposite cylinder. Finished up far past dark, so obviously no test flight tonight…will have to wait for the weekend. A lunchtime test flight to gather more data for troubleshooting the engine problem, and see if the idle mixture adjustment had any effect. Result: 5 in-flight power reductions to idle showed consistent results…the #2 cyl EGT drops to around 550 degrees, while the others run 800-900. With the throttle above idle, the EGT spread is quite small. There was no solo #2 EGT drop on the downwind power reduction this time, but that’s just a single data point. 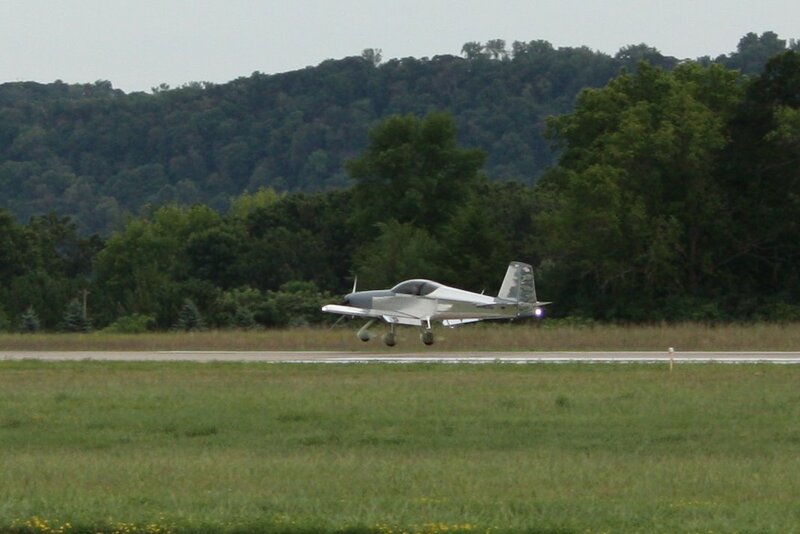 The stumble showed up again on final approach and the taxi back to the hangar with a hot engine and low RPM’s. My perception of the stumble is that each “dropout” is now dropping more RPM’s, and is longer in duration, than it was previously. Update 8/20: talked to several folks today including a local engine guy and the engine shop. I sent off the latest data logs to the engine shop, they’ll get back to me tomorrow with their next recommendation, which it sounds like may involve pulling a cylinder, according to their tech. Swell. Lovely weather has been hanging around, hard not to be a bit frustrated with these problems limiting ability to get up and dig into the flight testing. It’ll be obvious when the engine is fixed–the cruddy weather will return! 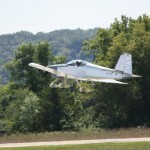 Made two short test flights today, in search of the solution to the engine problem. I’m starting to believe there are actually two separate things going on in there. One may be related to idle mixture/power adjustments, and the other seems heat related, possibly a vapor lock type situation with fuel vaporizing on the way to the spider. In any event, the compression on #2 has been checked good at 78/80, the cold EGT has been verified to stay with the cylinder and not follow the probe, injectors have been swapped, spark plugs replaced, and idle mixture and speed adjusted. I scuttled a third test hop later in the day because the hot engine was stumbling while taxiing out. I may get out there after church tomorrow morning to fly it and check if the idle fuel adjustments made any difference in the EGT drop problem. If today’s flights were a guide, it won’t stumble in the morning, since the engine will be cold. I’ve talked to both Jim and Tom Berge over the last couple days, and I think we have a plan for moving forward on the engine trouble. While a pull-thru test came out clean, Aerosport recommended a differential compression check — I don’t have the tools for that, so I’m going to meet up with Jim tomorrow morning and we’ll give it a go. I’ll also check up on the idle mixture and make adjustments as necessary to obtain the recommended 25-50 RPM rise at ICO. If all that comes out clean, I’ll flight test over the airport to see if the problem recurs, and go from there. To verify whether the #2 EGT drops I’m seeing are real (from a dead cylinder) or false (from a faulty EGT probe or wire), tonight I switched the probes between the #2 and #4 cylinders. If the drops continue on channel 2, the problem is with the sensor…if they move to channel 4, the problem is real with the cylinder. I’ll be examining the logs carefully after each flight. Reinstalled the RH seat pans after the antenna adventure the other day; I put a blob of RTV over each of the “spare” holes in the belly skin/doubler, to prevent unnecessary ingress of water and/or air. Completed the just-released Service Bulletin from Van’s, which required checking that all the wing bolts are inserted before further flight (apparently, some have been found where the two bolts in the spar web were never installed). Between having the RH seat pan off, and having a plethora of photos of that area to look at, it was simple to verify that all my bolts are installed & torque-sealed. Fixed the radio problem tonight, though the problem was not what I expected. Previously, I’d swapped the feedline and antenna from the installed Comm 2, to the prewired set for Comm 1, with no change in performance. I also removed the primer from the inside of the belly skin to provide a better ground plane; again, no difference. Monday night, I’d ordered a different bent whip antenna, since it seemed to indicate that the problem was in either the antenna or the radio. The antenna arrived today, so I took it to the hangar to test. Because my antenna has a 2-bolt mounting, and the new one has the standard 4-bolt mounting, I had to drill and deburr new mounting holes to install the new one. After installing it, I turned on the radio again and…same poor reception as before. Frustrated now, I had to check the one last part external to the radio — the short whip installed by the dealer, which connects the 90° mating connector on the radio tray, to a female BNC for connection to the airframe antenna feedline. After removing it, I opened the cap to the 90° connector and immediately saw that the center conductor had never been soldered; it was very nicely stripped and inserted into the proper place, but the conductor was not soldered to the connector pin. Yep, that’ll do it…I pulled out a soldering iron and made the connection. Reinstalled, and the AWOS now came in loud & clear in the hangar with the door closed. 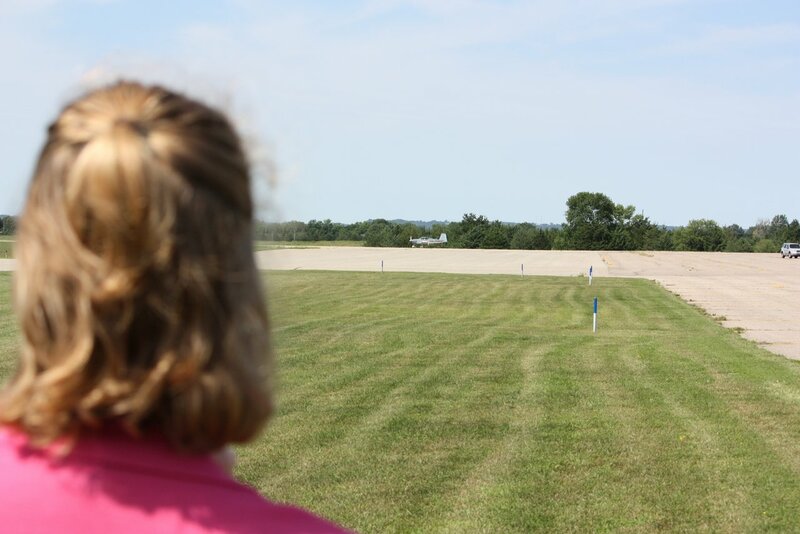 A flight test plane was also inspecting the airport’s navigation signals, so they were in the area for a while, and I was able to pick them up as they moved around the area. Interestingly enough, this also seems to have solved the odd behavior of the sidetone adjustment (where anything above 10 was earsplittingly loud; I’m now at 50-something and it’s perfectly comfortable). No real forward motion on the engine issue; I did inspect the EGT connections, they seem fine. Also pulled the prop through 12 compression strokes, and they all seemed fine at least to my uneducated hands. It was dark and threatening rain by the time I was set to start fooling with idle adjustments, so that’ll have to wait. More work trying to track down the engine trouble tonight. Verified the timing on both ignitions was a) correct and b) synced to the other ignition. Connected the Emag EICAD monitor software and verified that the position indicators read correctly and matched, and that the settings for advance, etc were correct. Checked that the overtemp sticker on both ignitions had not tripped. Everything seemed to check out OK, so I rolled the plane out to run the engine. I tried all the various combinations of ignitions on and off, ship power on and off, and so on. I never detected a stumble, and the data logs don’t indicate anything out of the ordinary either. There’s none of the EGT drops we saw in the logs from Saturday. So where does that leave me…feeling unsatisfied. I dislike intermittent problems that resolve themselves with no “smoking gun” to show why they happened. Granted, I don’t know that this has actually resolved, since it was never seen in any of the earlier ground runs and only happened after flight. Over the course of tonight’s 3 runups and some taxi time, the CHT’s reached the upper 200′s, but that’s far from the hard, hot running in flight. We did touch a bunch of things in the troubleshooting process — essentially every connection and wire in the ignition system, some spark plugs, fuel injectors — so if there was something loose or intermittent there, it could have been fixed. However, I guess I’m expecting the stumble to reoccur after the next flight, at which point we’ll be back to square one. While I had the RS-232 adapter out, I also reprogrammed the APRS transmitter to shut off the telemetry channels, since there’s nothing connected to them. Also verified that the AWOS is still scratchy and only occasionally breaks squelch while taxiing around the field. Applied ship’s power to each ignition in turn and watched that the LED indicator stayed on, while I wiggled all the wires and connectors from the power buss out to the ignition. Both checked ok.
Ungrounded each ignition in turn and checked that the P lead did not ground, while I wiggled all the wires and connectors from the ignition to the ground block. Both checked ok. Checked the connectors and wires at each ignition for security and tightness…all ok. 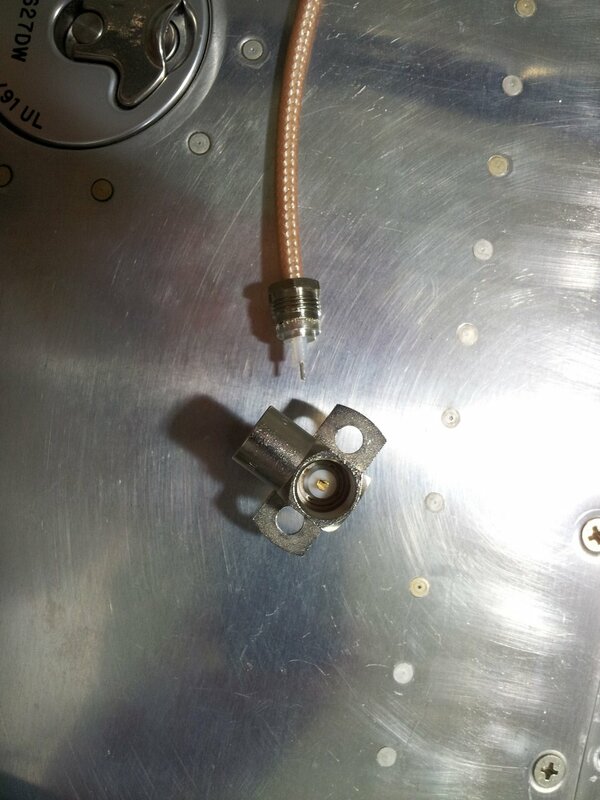 Put a meter on the #2 ignition leads from both ignitions, checking for the correct resistance per the Pmag book…ok. Wiggled the ignition leads and ends while watching the meter for a change…all ok. Pulled the plugs from #2 cylinder, along with one from #3 for comparison…looked similar, normal and ok. Removed the injector line from #2, verified that both the restrictor and injector body have no blockage. All ok, reinstalled injector. Unfastened all injector lines and directed into cups, conducted another flow test…all four lines flowed approximately equal volume. If anything, #2 had a tiny bit more fuel than the others, so it doesn’t look like it’s a fuel restriction. Inspected the airbox and fuel servo inlet for obstructions…nothing visible. At this point, I can’t think of more to do with it right now except pull it out and run it up, taxi around and see if I can make it stumble again. If it does, I’ll test the ignitions to see if I can isolate it to one side or the other. I could also try replacing the plugs on #2 in case one is internally damaged and not firing consistently. Raining tonight, so no going outside…hopefully tomorrow evening will be better. On to the next problem…the weak radio transmit and receive. The AWOS has always been faint and scratchy inside the hangar, and I just attributed it to the two layers of steel walls, but the transmissions yesterday weren’t right, and the AWOS in the air was weak, too, even at 5 miles from the field. Swapped the connection at the radio from the #2 antenna and feedline, to the #1. No change. Back to #2 antenna and line…Removed the #2 antenna and doubler, removed the primer from the belly skin where the doubler sits, scotchbrited and cleaned both, and reinstalled. No change. Tested the feedline with a meter for shorts…none, tested ok.
Fiddled with the configuration settings in the radio. No change. Had Allison go outside with my handheld (which I’ve been listening to traffic on, inside the hanger, for the last few months, without any problem, receiving transmissions from this airport and others). 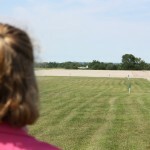 When right outside the hangar, it was fine, but she lost contact at the end of the hangar row (a few hundred feet away). Also observed: sometimes when the mic is keyed, the sidetone isn’t normal sounding, it’s very weak and distorted, unintelligible. Unkeying and immediately rekeying the mic will make it sound normal. Also observed: the sidetone level setting seems very low; anything above 20 or so (out of 255) is deafening. The factory default was something like 170. I think I’m set at 17 now, and it’s quite loud, louder than I want it. Turning the sidetown level down too far causes it to become quiet but very distorted (aside from the occasional distortion on transmit above). Also observed, but unrelated: the “radio mutes music” key on the audio panel doesn’t seem to work properly, the radio is always muting the music, whether the function is on or off. So either I have 2 very poorly performing antennas, or there’s something odd in the radio or the radio install. The only part of the antenna system that remained common to both antenna tests, is the short whip from the radio tray’s right-angle BNC, to the BNC-F that the antenna feedline connects to. I’ll get back under there and pull that part to inspect for bad connections, just in case. Another potential test is to secure a different type of antenna from someone, mount it to a big piece of aluminum on a sawhorse for a ground plane, and connect it to the radio with a coax line for testing. The replacement antenna would be a Comant CI-122 or the like, which has a different mounting pattern than the antennas I have now, so I’d want to prove it out before drilling a new set of holes in the belly and making new doublers. I was hoping that removing the primer would do the trick, so I could put the seat pan back on; it’s a structural piece so can’t fly with it removed, and the quantity of screws make it a real joy to keep taking off & on again. Alas, that’s the way it goes. So, nothing resolved tonight, but hope for the future…if tomorrow night has decent weather I should be able to get it out of the hangar and do some ground testing on the engine problem. No, not superman, actually, it is a plane. After nearly six years of construction and 1950 hours in the shop (not counting the time spent researching, planning, ordering parts, and so on), today was the big day. We couldn’t have had better weather if it had been custom ordered. Clear skies, winds practically dead calm, and impressive flight visibility for most of the day. I met test pilot and transition trainer Tom Berge at the airport shortly after 7am, and we discussed the plan for the day. 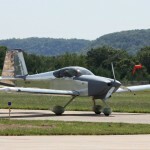 I needed to complete 3 more hours of transition training in Tom’s RV-7A, and then there was the first flight business. 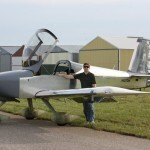 Tom needed to fly my plane for a full hour to satisfy insurance requirements and verify the data from the first flight. So we decided that we would do half the training, come back to inspect, reassemble, and fly my plane; then finish the transition training, and then the remainder of the first hour on my plane. 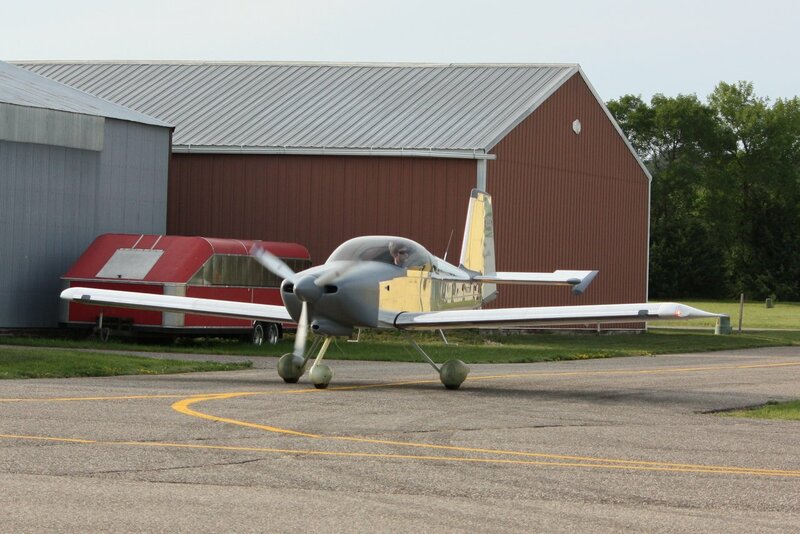 We flew the first 1:45 of training, focused on emergency procedures, to the north and came back to Red Wing. 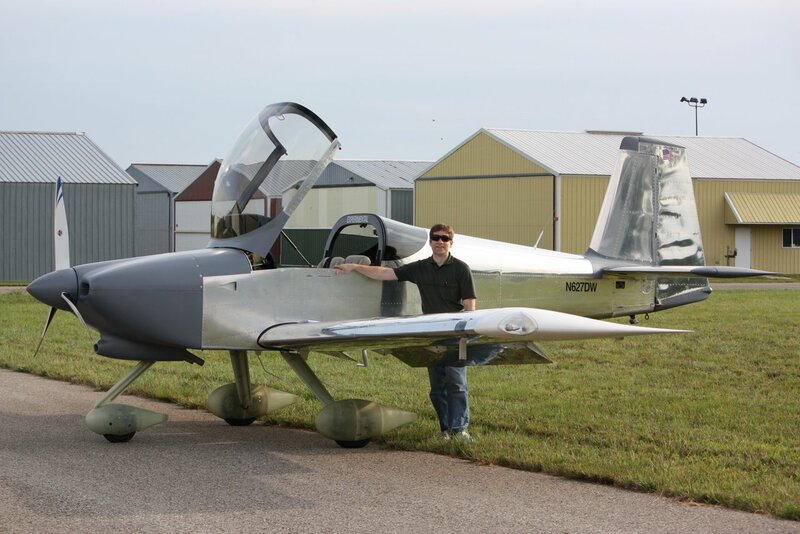 Tom worked through his final inspection of the plane, and I worked on installing the inspection panels and cowling while Allison was treated to a quick hop in Tom’s 7A. Then it was ready to go, after talking through the systems and instrument panel. 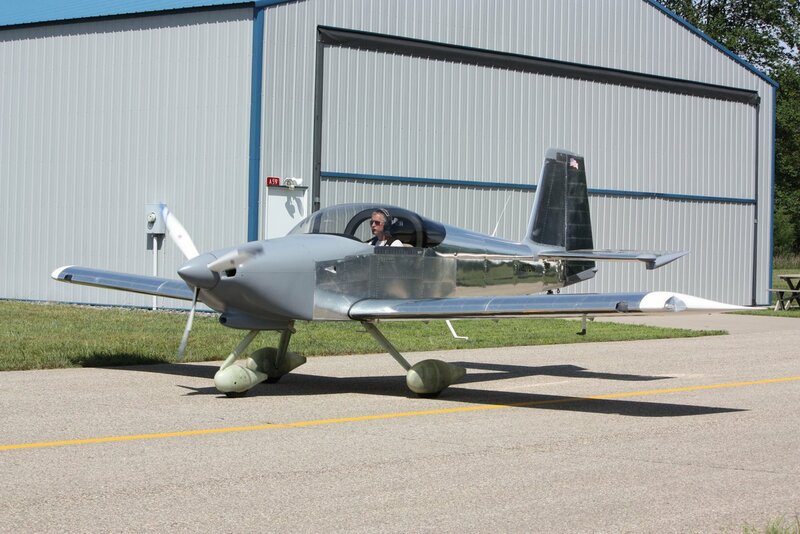 Pulled the plane out and started her up, and he headed off to the runup area for the final ground checks. By the time Allison & I walked out to the taxiway, he was almost ready to go, and an uneventful takeoff and climbout ensued. 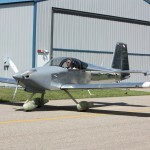 He circled the airport for several laps before heading to the northeast to climb up and explore stalls and slow flight, and determine airspeeds and power settings for the pattern. A quick call on the radio let me know everything was working fine so far. After 35 minutes or so, back to the airport for landing (which happened down at the far end of the airport, so no photos of the actual landing). 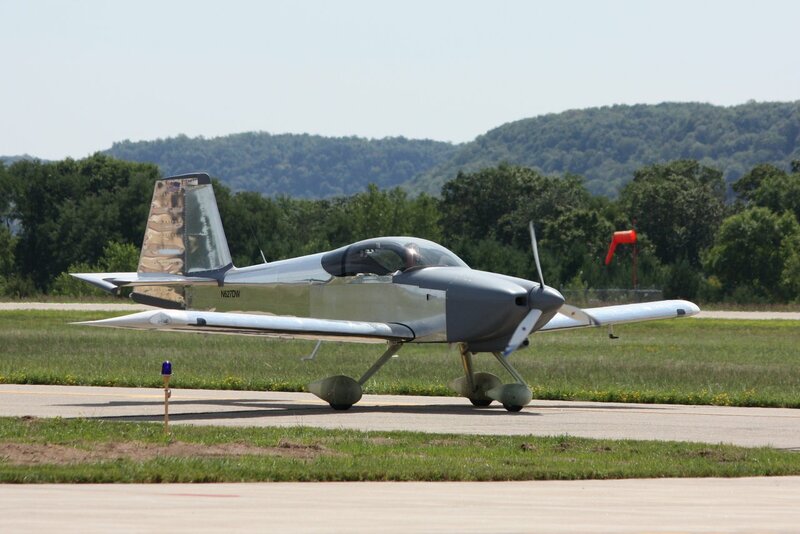 Off to lunch for food and discussion, then we headed south for the remainder of the transition training; we headed to Winona, which is the southernmost point of my small test flight area (which is essentially 1/4 of a 30NM radius circle from Red Wing: KRGK-3T3-KLUM-KONA-KRGK). 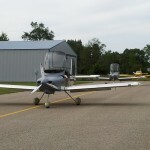 Stalls, slips, and aborted takeoffs this time, then back to Red Wing. Another half hour or so of test flight by Tom got us to 1.1 of flight time on the plane so far. By the time he headed back to the airport, Bob Collins and Brad, another local RV builder, had stopped by to say hi, Bob having just finished his 40 hour flight test period. 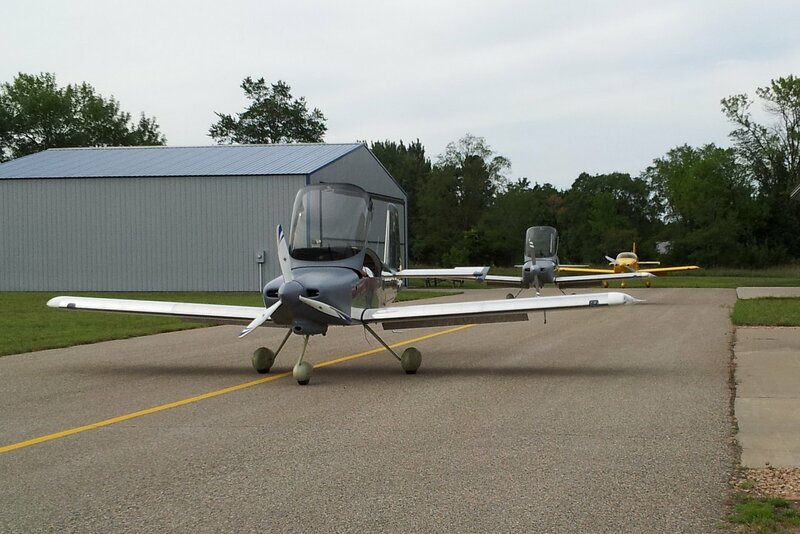 After Tom landed and taxied back, I snapped this photo of the three RV’s lined up on the ramp. Tom & I talked through the list of squawks, transfer of knowledge on the pattern flying power settings & airspeeds he determined during his test flights, then he signed the logbooks and turned the keys over to me. I decided to take a bit of a walk to relax and breathe a bit before taking the plane up myself. Tom departed in his 7A, and after 15 or 20 minutes, and readjusting the seats & harnesses, it was time to head up. The winds were still calm, though the summer haze had returned as the day wore on. 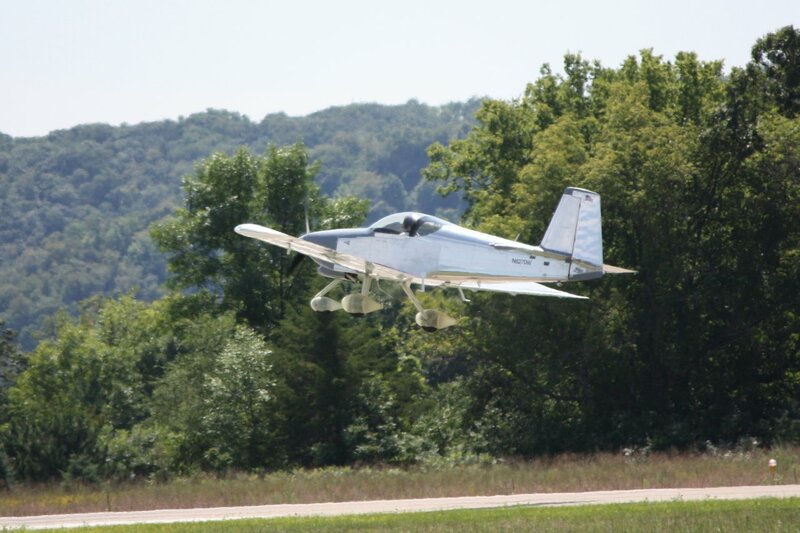 Taxi and runup, radio call, takeoff…yep, she flies like an airplane. 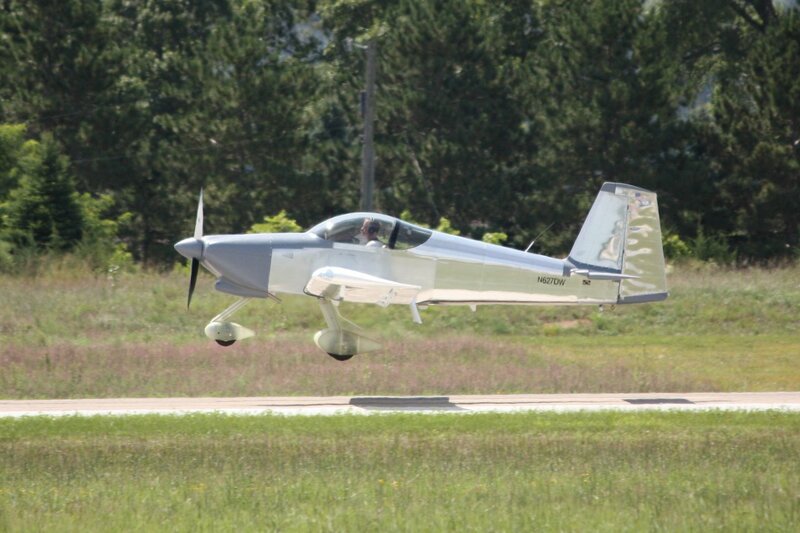 I flew a similar profile as the first flight: several racetracks over the field climbing to 4500′, then off to the northeast for stalls and pattern simulation at 5500′. After flying around for a bit east of Ellsworth, I brought it back to the airport and descended to pattern altitude…the first approach ended up being quite high–as I’d really expected it to be, since this plane doesn’t come down as readily as the 7A. For experience, I held the descent to about 100′, then went around again. 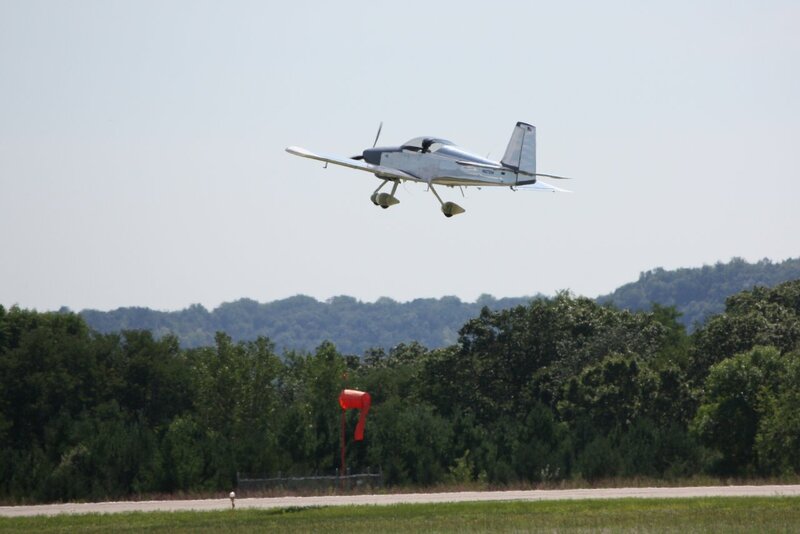 Adjusting the second pattern resulted in a fine approach and landing. She flies! The stick forces are significantly higher than I had grown used to in the 7A, it really takes a solid pull to hold full up elevator. Roll rate is slower than the 7A, so it’s not quite as “fun,” but feels more solid and stable. As with any complex piece of machinery, there are several bugs to work out (including weak radio and a heavy left wing), but we’ll get there in due time. It’s going to be fun. This has been a major project, and I couldn’t have done it alone, there are many people to thank…a bunch of locals, Pete Howell (RV-9A, whose travel stories are an inspiration unto themselves), Mike Behnke (RV-9A, who gave my first RV ride, and who my panel design is modeled after), Bob Collins (RV-7A, author and collector of RV stories on his website, inspiration, and help with the airworthiness documentation), and the others who I’ve met or planes I’ve looked at during the builder’s club meetings. The online RV community and all the folks who post their build logs on the web for us others to research and steal ideas from. The inimitable Tom Berge, for putting up with me through 15 hours of transition training (boost pump off, don’t raise the nose! ), advice on the plane and flying in general, and putting his life on the line for the first flight. And of course, to Allison, who has tolerated parts and plans scattered around the house…fuel tanks in the living room…her car being kicked out of the garage to make way for larger airplane parts…my lack of lawn care in favor of more shop time…all the lonely evenings with me hiding in the shop or hangar (it’ll be different having me around the house again, I’m sure)…airplane purchases draining money out of our account as fast as we can put it back in… And through all of it, managed to smile and tell me I should quit complaining and get back to the shop. Add one to the big board … N627DW has flown. 25 queries in 0.308 seconds.